“Rent” is a lively ongoing celebration. It’s also a remembrance, of a certain time of youthful idealism, of a strange and wonderful time in New York City and of those lost in the AIDS epidemic. One of the biggest hits in modern Broadway history, “Rent” is a musical about a bunch of creative young people with money problems. It’s about a bunch of downcast New Yorkers looking for love. It’s about the rise of a new American Bohemian movement. It’s about partying. It’s about living with AIDS and losing loved ones. 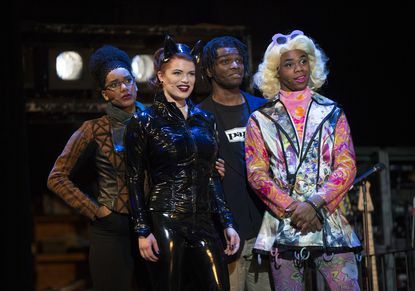 An anniversary tour of the show is reminding audiences of what “Rent” meant more than 20 years ago, and how important its messages of peace, tolerance and self-worth still are today. “Rent” changed the face of Broadway musicals. It’s hard to imagine “Be More Chill,” “Dear Evan Hansen” or “In the Heights” making it to Broadway without “Rent” having paved the path. “Rent” brought in a younger, livelier audience than most Broadway producers even thought existed. How Larson ended up taking over the concept, basing the musical on some of his own experiences living in a rundown, artistically vibrant neighborhood in Lower Manhattan. How he also wanted to write about the burgeoning AIDS crisis in 1990s New York, attending support group meetings to make sure the depiction was credible. How Larson worked as a waiter while spending years writing and rewriting “Rent.” How the show earned a reading at New York Theatre Workshop in 1993, then a workshop production at the same space a year later. How Jeffrey Seller and Kevin McCollum decided to become the producers of the show after seeing just the first act of the workshop. How, on the day of the first performance of the show’s first full production, off-Broadway in January 1996, Larson died suddenly from an aortic aneurysm. “Rent” was an instant smash hit, running for 12 years on Broadway and touring constantly from 1996 to 2010. A mediocre 2005 movie adaptation and some poorly conceived revivals eventually slowed its once unstoppable momentum. Now folks are paying some attention again. The show’s 20th anniversary tour began in 2016, and has been such a success that the Bushnell stop marks the third time it has visited Connecticut. The “Rent” tour hits Hartford just after changing its cast (from an Equity union company to a non-Equity one). The Courant spoke to the tour’s producer, Stephen Gabriel of Work Light Productions. Gabriel, who runs Work Light with his wife Nancy (a graduate of the Hartt School), remembers what “Rent” was like 20 years ago, and recognizes how meaningful the show still is today. Q: This 20th anniversary tour has been running so long, it’s now almost the show’s 25th anniversary. Did you expect it to be so popular? “When you bring a show like ‘Rent’ back, it’s so iconic, but you don’t really know if it’s in the zeitgeist anymore. This tour has done so well. It was in the top five of touring Broadway shows, next to major tours. We’re being put on seasons with first-run Broadway shows. We’re bringing in young audiences. It shows you that ‘Rent’ really was the ‘Hamilton’ of its time. Q: What’s it like bringing in a new cast? “The new cast started in the fall, and will go until September. They started just after the last cast brought the tour to China. Q: “Rent” has always been known for its ethnically diverse cast, but even though the racial background of most of the characters isn’t specified, they tend to be cast with the same ethnicities. “We’re not casting to a type, but the show has kind of typed itself. The girls who want to do Maureen have been told that’s the role for them since they were in high school. The role of Angel is interesting. It tends to be fluid, from Latino to African-American. Q: Maureen’s “Over the Moon” number parodies a very specific type of downtown New York performance art from the ‘90s. Do young performers today understand it? Q: How close is this 20th anniversary tour to the original production? “Michael Greif, who of course was the original director of “Rent,” is the director of this tour. This is still his production. Our choreographer is the original choreographer, Marlies Yearby; she’s put in every cast we’ve had. These are Paul Clay’s sets, Angela Wendt’s costumes … from the top down, the creative team is the same. Q: What’s your personal connection to “Rent”? RENT runs March 12 to 17 at The Bushnell, 166 Capitol Ave., Hartford. Performances are Tuesday through Thursday at 7:30 p.m.; Friday at 8 p.m.; Saturday at 2 and 8 p.m.; and Sunday at 1 and 6:30 p.m. Tickets are $23 to $126. 860-987-5900 and bushnell.org.